Read up on KIMAA’s other senior instructors and their Kyokushin Karate profiles here. Shihan Howard Lipman is awarded his 5th Dan in Kobudo by Sensei Hokama, November 2011. Hanshi Howard Lipman is 7th Dan in Kobudo and 9th Dan in Kyokushin Karate. In January 2008, Hanshi Howard met Sensei Hokama in Okinawa and knew at once that this Sensei was the man whom he wished to continue his martial arts studies. Hanshi Howard returned to Okinawa in May of 2008 with Shihan Rick Cunningham and a group of four other black belts. This was the beginning of the three trips per year to Okinawa, returning in August and October that year. The trips have continued each year, with the main purpose being to learn Kobudo (weapons) to pass on to Hanshi Howard’s existing Kyokushin students to broaden their knowledge of the martial arts. At the end of the October trip, Hanshi Howard was appointed the Australian Branch Chief of the International Hokama Kobudo Organization. Hanshi Howard has organised numerous Kobudo seminars. In 2009, Sensei Hokama came to Australia at Hanshi Howard’s invitation to instruct KIMAA students. In 2011, Hanshi Howard was graded to 5th Dan (“Master”) in International Hokama Kobudo. In September 2012 Sensei Hokama returned to Australia and was involved in a weekend seminar with the KIMAA students, organised by Hanshi Howard. At the end of this seminar, Sensei Hokama graded Hanshi Howard to Renshi in Kobudo, awarding him the rank of 6th Dan (Rokudan). In the 2015 Japan Group Tour, Sensei Hokama promoted Hanshi Howard to 7th Dan in Kobudo. It was during this trip that Hanshi Howard met Shihan Ken Ogura (8th Dan) from Sensei Hokama’s organisation. Hanshi Howard hosted Shihan Ken for a week in November 2016, when Shihan Ken taught a seminar in Karate and Kobudo for KIMAA students, and again in September 2017 and September 2018. Hanshi Howard returned to Okinawa once again in the KIMAA Japan Group Tour 2017 for further training with Sensei Hokama and Shihan Ken. Shihan Rick Cunningham is awarded his 4th Dan in Kobudo by Sensei Hokama, November 2011. Shihan Rick Cunningham is 6th Dan in Kobudo and 6th Dan in Kyokushin Karate. Shihan Cunningham began his Kobudo training in Okinawa with Sensei Hokama and Hanshi Howard Lipman in 2008. He has continued to travel several times a year with Hanshi Lipman to Okinawa to further his knowledge of Kobudo to pass onto the KIMAA students. In 2011 Shihan Rick was graded to 4th Dan in Kobudo by Sensei Hokama, and given the rank of Shihan-dai. At the conclusion of Sensei Hokama’s 2012 Australian seminar with KIMAA, Sensei promoted Shihan Rick to a full Shihan in Kobudo and the rank of 5th Dan. In the 2015 Japan Group Tour, Sensei Hokama promoted Shihan Rick to 6th Dan in Kobudo. Shihan Rick has had significant involvement in running various Kobudo seminars, as well as the fortnightly classes at Annangrove Dojo. Shihan Rick helped organise the 2016, 2017 and 2018 Shihan Ken seminars, after having met Shihan Ken in the 2015 Japan trip. Shihan Rick returned to Okinawa to train with both Sensei Hokama and Shihan Ken in the 2017 group trip. Sensei Mark Shelmerdine is awarded his 3rd Dan in Kobudo by Sensei Hokama, September 2012. Sensei Mark Shelmerdine is 4th Dan in Kobudo and 4th Dan in Kyokushin Karate. Sensei Mark travelled to Okinawa with Hanshi Howard Lipman and Shihan Rick Cunningham in 2008 and was taught by Sensei Hokama. Sensei Mark has since gone back many times over recent years to train, and was graded by Sensei Hokama to 2nd Dan in 2009. He regularly assists with teaching at the Annangrove Dojo fortnightly Kobudo classes. In the twice-yearly KIMAA seminars, Sensei Mark is always instrumental in instructing students in the Bo, Sai, Eeku or other weapons. Sensei Hokama graded Sensei Mark to the rank of 3rd Dan in Kobudo in September 2012. Sensei Mark also went on the KIMAA Okinawa Tour in 2013. Sensei Mark was graded to 4th Dan in Kobudo by Hanshi Howard and Shihan Rick in February 2015. Sensei Hokama certified this grading during the 2015 Japan Group Tour. Sensei Mark enjoyed the experience of training in Kobudo with Shihan Ken Ogura in the 2016, 2017 and 2018 seminars. He returned to Okinawa for his fifth time on the KIMAA Japan Group Tour 2017, where he trained again with Sensei Hokama and Shihan Ken. Sensei Paul Finnerty is awarded his 2nd Dan in Kobudo by Sensei Hokama, September 2012. Sensei Paul Finnerty is 3rd Dan in Kobudo and 4th Dan in Kyokushin Karate. Since being awarded his 1st Dan in Kobudo he has regularly assisted with teaching at the fortnightly Annangrove Dojo Kobudo classes. In the 2011 Kobudo Seminar and Sensei Hokama’s Australian visit in 2012, he taught the beginner groups the basics of the Bo staff. At the end of the 2012 seminar, he was graded to 2nd Dan in Kobudo by Sensei Hokama and Hanshi Howard Lipman. Sensei Paul was graded to 3rd Dan in Kobudo by Hanshi Howard and Shihan Rick in February 2015. Sensei Hokama certified this grading during the 2015 Japan Group Tour. Sensei Paul trained with Shihan Ken Ogura in Kobudo in Shihan Ken’s 2016, 2017 and 2018 seminars. In 2017, Sensei Paul participated in his first trip to Japan in the KIMAA group tour, during which he trained with Sensei Hokama and Shihan Ken. 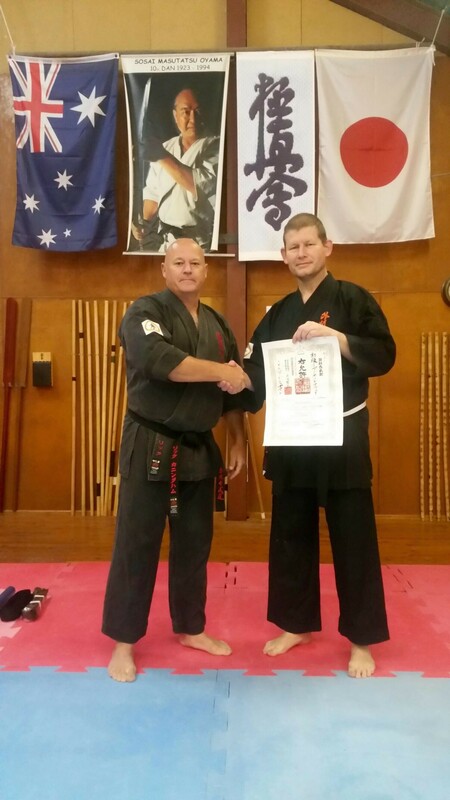 Sensei Mark is awarded his 3rd Dan in Kobudo by Sensei Hokama, March 2015. Sensei Mark McFadden is 3rd Dan in Kobudo and 4th Dan in Kyokushin Karate. Sensei Mark travelled to Okinawa with Hanshi Howard Lipman and others in October 2008 to learn Kobudo from Sensei Hokama. He was graded to 1st Dan in 2009 by Hanshi Howard. Sensei Mark has been leading the North Coast Kobudo classes at Lismore Dojo since 2008. Sensei Mark and his students have continued to benefit from the instruction of Sensei Hokama during his 2009 and 2012 visits, as well as participating in other Kobudo seminars organised by Hanshi Howard and Shihan Rick. Sensei Mark was promoted to 2nd Dan in Kobudo in March 2013 by Hanshi Howard. 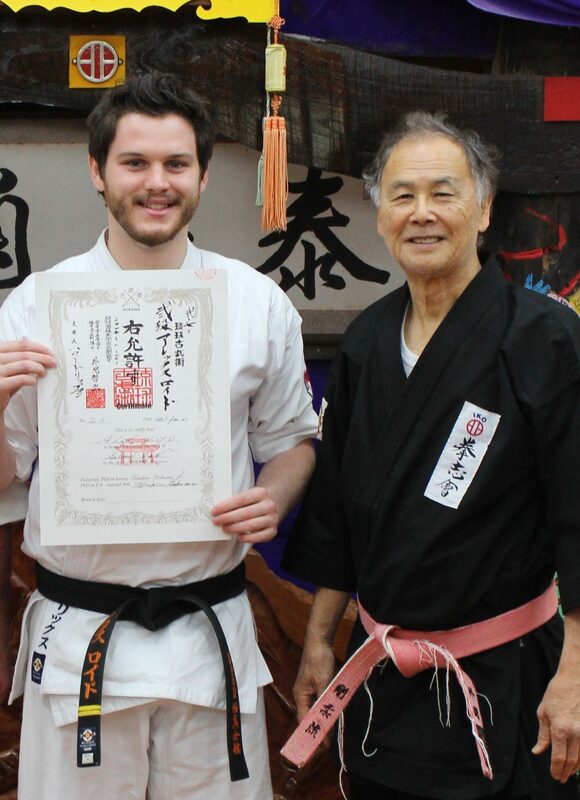 He received his certificate from Sensei Hokama on the KIMAA Okinawa 2013 in November 2013. Sensei Mark went on the Japan Group Tour in 2015, at which time Sensei Hokama graded Sensei Mark to 3rd Dan in Kobudo. During this trip, Sensei Mark also trained with Shihan Ken Ogura. Sensei Mark trained with Shihan Ken again in the 2016, 2017 and 2018 seminars. Sensei Mark undertook his fourth visit to Okinawa on the Japan Group Tour 2017, where he trained with Sensei Hokama and Shiahn Ken. Sensei Jon is awarded his 2nd Dan in Kobudo by Sensei Hokama, March 2015. Sensei Jon Ellis is 3rd Dan in Kobudo and 3rd Dan in Kyokushin Karate. Sensei Jon was graded to 1st Dan in Kobudo at Annangrove Dojo in July 2010. Sensei Jon travelled to Okinawa with Hanshi Howard Lipman and others in December 2010-January 2011 to learn Kobudo from Sensei Hokama. Sensei Jon teaches at the North Coast Kobudo classes along with Sensei Mark McFadden at Lismore Dojo. He regularly attends Sydney-based seminars run by Hanshi Howard and Shihan Rick. Sensei Jon has participated in seminars with international instructors, including Sensei Hokama’s 2012 visit to Australia and Shihan Ken’s 2016, and 2017 seminars. Sensei Hokama graded Sensei Jon to 2nd Dan on the Japan Group Tour 2015. Sensei Jon was then graded to 3rd Dan by Sensei Hokama on the Japan Group Tour 2017. Sensei Alex Lloyd is awarded his 2nd Dan in Kobudo by Sensei Hokama, January 2017. Sensei Alex Lloyd is 3rd Dan in Kobudo and 3rd Dan in Kyokushin Karate. He began his study of International Hokama Kobudo in 2011 and participated in Sensei Hokama’s Australian seminar in 2012. Sensei Alex has continued his study of Kobudo under Shihan Rick Cunningham at Annangrove Dojo. 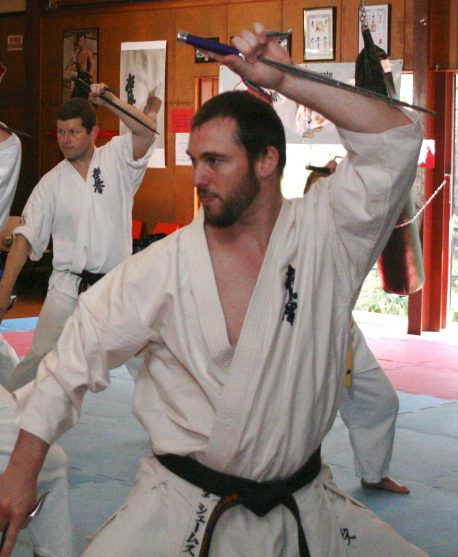 He became an instructor of Kobudo to students at Turramurra Dojo as part of the general classes, as well as teaching weapons during KIMAA seminars. Sensei Alex travelled to Okinawa to train in Kobudo with Sensei Hokama in 2013, 2015 and 2017. He also trained with Shihan Ken Ogura in the latter two Okinawa trips and the 2016, 2017 and 2018 seminars in Australia. Sensei Alex was graded by Sensei Hokama to 1st Dan in Kobudo in 2015 and to 2nd Dan in 2017. In 2018, Hanshi Howard Lipman graded Sensei Alex to 3rd Dan in Kobudo, which was certified by Sensei Hokama. Sensei James Sidwell at the 2012 Sensei Hokama KIMAA Seminar. Sensei James Sidwell is 2nd Dan in Kobudo and 4th Dan in Kyokushin Karate. Sensei James was on the inaugural KIMAA 2008 trip to Okinawa to study Kobudo under Sensei Hokama. Sensei James continued his study of Kobudo back in Australia, including at the 2009 and 2012 Australian KIMAA seminars. Sensei James was graded to 1st Dan in Kobudo in 2009. Sensei James returned to Japan in the 2017 KIMAA Group Tour to train with Sensei Hokama. He has also trained with Shihan Ken Ogura in the 2016, 2017 and 2018 seminars. He was graded to 2nd Dan in August 2018, which was certified by Sensei Hokama in September. Sensei Ian Holdaway is presented his 1st Dan Kobudo certificate by Shihan Rick Cunningham, May 2015. Sensei Ian Holdaway is 1st Dan in Kobudo and 3rd Dan in Kyokushin Karate. Sensei Ian began his study of International Hokama Kobudo in 2008 during the third KIMAA trip to Okinawa to study under Sensei Hokama. Sensei Ian has continued learning Kobudo under Shihan Cunningham at Annangrove Dojo. He has also had the opportunity to train with Sensei Hokama during the 2009 and 2012 Australian KIMAA seminars. At other KIMAA seminars, Sensei Ian is a regular instructor to beginner groups, particularly in the Bo staff. Sensei Ian was graded to 1st Dan in Kobudo by Hanshi Howard Lipman and Shihan Rick Cunningham in February 2015, which was certified by Sensei Hokama in the KIMAA Okinawa Tour in March that year. He has trained with Shihan Ken Ogura during the 2016, 2017 and 2018 seminars.